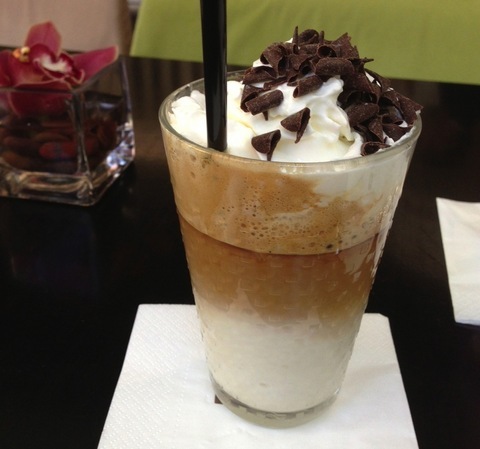 The Nespresso Boutique, in New York City's So Ho neighborhood, makes my favorite indulgence which they call iced café, but is actually so much more! It is a scoop of excellent ice cream with a double shot pour of Arpeggio espresso, topped with a cloud of whipped cream, sprinkled with a pleasing crunch of semi-sweet chocolate mini curls. It is served with a long spoon so that one can reach down and grab a little of each harmonious element with each sip or should i say bite. Truly it is half way between the two and no doubt a good part of what makes it so very irresistible.